"Why is that song such a favorite with metro musicians?" is what Anne (Just Another American in Paris) asked after I tweeted, "Saturday morning in Paris. 'Besame Mucho' on the metro." along with a snapshot of the singer/saxophone player. Lucho Gatica's version of "Besame Mucho" made the song famous. Even though I'm fairly sure that Anne intended it to be a rhetorical question, I nonetheless pondered the answer and came up with a possible explanation when my Swiss father-in-law told me that he has always preferred Josephine Baker's rendition of "Besame Mucho". Is the American born French singer, dancer and actress responsible for the connection between the metro musicians and the famous Mexican boléro? I don't know, but please click here if you would like to listen to her version on YouTube. Unfortunately, I couldn't embed it in the post because of licensing issues. The following photos don't have anything to do with kissing or the song. They're just what caught my eye while the refrain was playing over and over again in my mind yesterday afternoon. Christian Dior is offering free engraving to personalize bottles of perfume from their new collection at Galeries Lafayette. 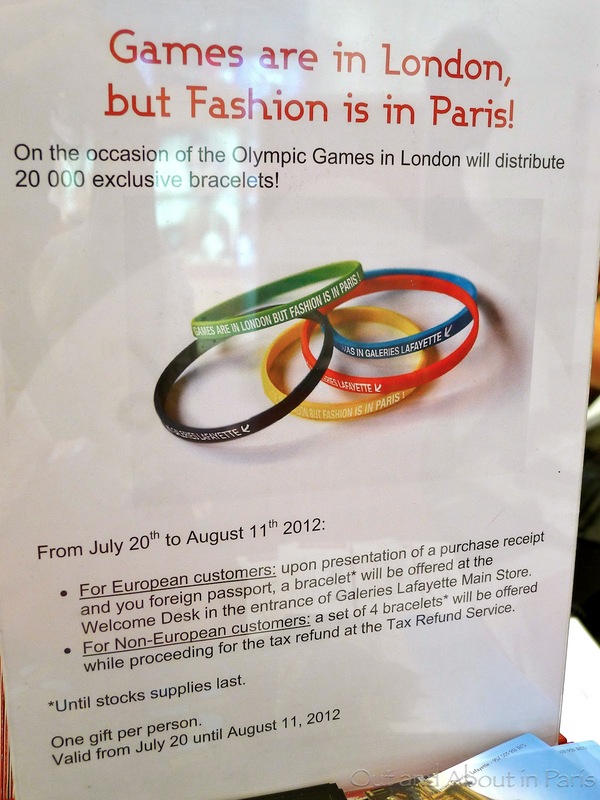 "Games are in London, but Fashion is in Paris". 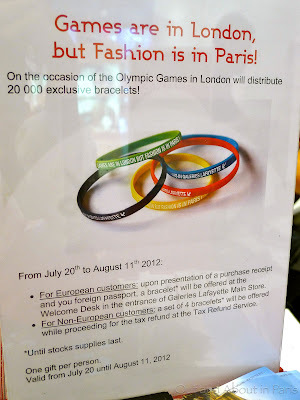 The French capital didn't win the bid to host the 2012 Olympic Games, but Galeries Lafayette still found a colorful way to celebrate the major international sporting event. "Control your vehicle in the curves" and "Slow down". Warning signs written only in French. Even though it's Stephane's mother tongue, you would have thought that he didn't understand the words because I was forced to to some back seat driving as we raced around the grounds of Château Vaux le Vicomte with his father in a golf cart yesterday evening. I love that song! So romantic. I'm starting to feel a few twinges of homesickness for Paris, mostly when I read your blog. Keep things in order for me until I get back, ok? You've been in GL a lot lately. Self control MK, self control. Beautiful shots of Chateau Vaux-le-Vicomte. Come to think of it - I have been in GL a lot lately but oddly enough I never buy anything there. Well, except some Paris themed coasters to take to our kids. I was just tagging along while my father-in-law did some shopping. He bought some Memphisto shoes because they're considerably less expensive in Paris than in Switzerland. Listening to the Diana Krall version right now. Keep it coming, Mary Kay. Isn't it amazing that there are so many versions of "Besame Mucho"? Thanks for answering my inane tweet and prompting the discussion with my father-in-law. He has been coming to Paris on a fairly regular basis since 1948 and it was interesting to hear about his memories of Josephine Baker, etc. Back seat driving is a good thing if there's a man at the wheel! True, especially if there's a Swiss man at the wheel who is pretending that he's driving a golf cart on a curvy road in the Alps! You guys get "Besame Mucho"?? Lucky vous! I always get stuck with a clarinet version of "Just a Gigalo" which makes me think more David Lee Roth than Louis Prima.